Do Bed Bugs Jump or Fly? 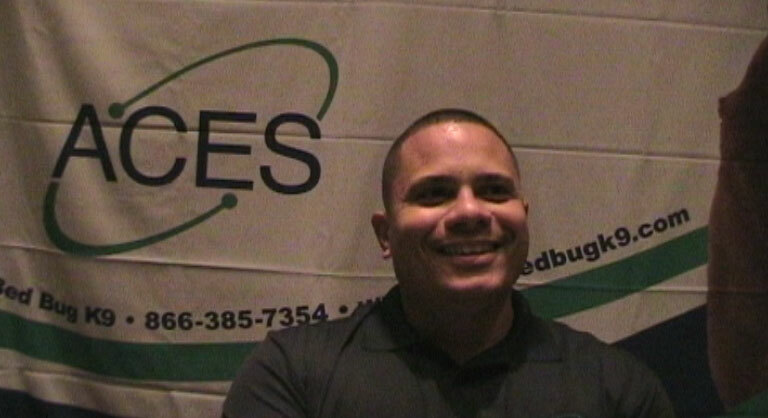 ACES’ Certified Trainer is Ray Figueroa, a seasoned and confident canine professional with extensive experience in the training and assessment of working canines. Ray currently works as a canine trainer and handler in law enforcement for a city in the metro Atlanta, GA area. Ray brings the clientele of ACES a broad-ranging background. His canine experience encompasses law enforcement, canine operations, training and training management in a broad range of working environments including law enforcement, search and rescue, and protection canines. Ray has trained canines with specialties in narcotics, explosives, cadaver detection, and with ACES, Bed Bug detection. Ray has also trained canines in the art of protection work; article searching; urban/wooded search-and-rescue; basic, advanced, and competition obedience; and behavior modification for problematic dogs. He believes that canine training is an ongoing process, and considers himself a willing student who is always learning more about dogs, and how to properly train and work with them. Ray has handled canines professionally for over seven years, and as a certified trainer for over five years. Ray’s experience also includes personally handling three different law enforcement canines on the streets of metro Atlanta. He certified all three dogs numerous times with NAPWDA (North American Police Working Dog Association), NNDDA (National Narcotics Detector Dog Association), and L.E.T.S. (Law Enforcement Training Systems). Ray is also an instructor/certifying official with L.E.T.S., and travels the country teaching seminars and certifying in detection work. Ray has been a police officer for 11 years, currently serving as a k-9 handler. He is also on the hostage negotiation team as the Spanish-speaking negotiator, and spent three years as a narcotics officer, two years on the gang unit, five years on the department SWAT team. Ray is a Georgia certified Police Instructor teaching at the local regional police academy. Ray holds an associate’s degree in criminal justice, and proudly served the US military, stationed out of Fort Stewart, GA.
We are updating our website, so it is currently a little less than it should be. Please bear with us as we adjust, and recreate our web experience for you!